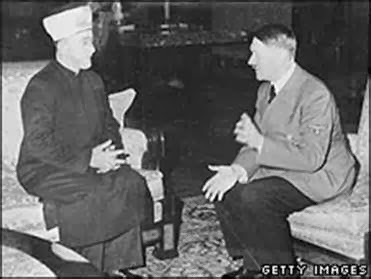 Haj Amin al-Husseini, the Grand Mufti above, met with Hitler in 1941. He had gone before the Royal Commission in Britain on January 12, 1937. Lord Peel spoke with him and said: You want to completely stop Jewish immigration. What do you want to do with the 400,000 Jews here at the present? It was brought out by the Mufti that 700,000 dunams were sold to the Jews by Arab landowners. Mufti answered: They will live as they always did live previously in Arab countries, with freedom and liberty, as natives of the country. In fact, Moslem rule has always been known for its tolerance, and as a matter of fact, Jews used to come to Eastern countries under Arab rule to escape persecution in Europe. According to history, Jews had a most quiet and peaceful residence under Arab rule. Mufti told Sir L. Hammond that the Arabs would be happier under Turkish "Ottoman rule" than under the present mandatory rule. The Truth: Jews and Christians in Muslim countries were Dhimmis, 2nd-3rd class people who had to pay a tax for living there. They were subjugated under rules others did not have. They were living under better conditions than Jews in Europe, that part was true, but were also attacked occasionally in pogroms. An example was in 1941, the Jewish community in Bagdad was attacked by mobs causing 180 Jews to die. This was at the start of WWII. Note: This 1937 meeting occurred at the beginning of Hitler's attacks on Jews. England went along with his request and kept Jews out of entering "Palestine" which was the promised Jewish Homeland since 1920. At the same time, they allowed many Arabs in from surrounding states. The Balfour Declaration was issued on November 2, 1917 pledging support for the establishment in Palestine of a national home for the Jewish people. An agreement was concluded on January 3, 1919 between King Hussein's son, Emir Feisal, chief Arab delegate at the Paris Peace conference. and Dr. Chaim Weizmann. It was endorsed and Palestine recognized as a separate Jewish entity, with which the then imminent Arab State would maintain diplomatic relations on condition that Britain and France met Arab demands in other territories. The British were highly ambivalent towards estabishing a Jewish national home. Sometimes they allowed Jews into the country, but at the most serious time nearing WWII, kept them away. That the Arabs were on the side of the Axis during WWII is a known fact. Hitler's goal during that war was to exterminate all Jews in the world and managed to slaughter 6 million of the Jews of Europe. The Grand Mufti of Jerusalem was very jealous of Abdullah of Transjordan who was able to create a state out of the Ottoman Empire through the mandate held by Britain. England took 80% of land promised to the Jews by the League of Nations for a Jewish Homeland and gave it to Abdullah for his participation in fighting against the Ottomans during World War I. The fact remains that Chaim Weizmann's contribution to the British was his scientific endeavors to improve their ammunition which without this, they would have lost the war. Jews also fought for England. One of the methods used by the Arabs against Israel today is to take known facts and twist them around to put themselves in a better light. Because so many of their people have been kept in an academic blackout, they believe all the propaganda their leaders feed to them. "It has not been uncommon for the PA to accuse Israel of imitating Holocaust crimes or claim that Israel uses the Holocaust as a tool for political and financial gain. At the same time they continue to show their admiration of Hitler. The one thing they are in denial of is that Arabs are Semites, same as Jews, and Hitler was creating the Aryan race, so they would have been next on the list of those unwanted people scheduled for the ovens as well. They are behind all the BDS groups and call Israel an Apartheid State though it has 1.7 million Arab citizens, which they are not in any form of definition Apartheid, yet they plan to have Palestine Judenrein, meaning that not one Jew will be allowed to live in their state, a truly Apartheid state. My hope is that the rest of the world, though removed by 69 years from the end of WWII, have had more education and realize that Jews were the oppressed people of the Nazi party. 6 million were rounded up and killed unmercifully. Israel was created for Jews after the first World War of 1914-1917 since they had fared terribly from anti-Semtic acts for the past 2,000 years since losing their capital, Jerusalem, to the invaders, the Romans. They needed their own state. That is why the League of Nations decided that their land, which had been part of the holdings of the Ottoman Empire for the past 400 years, was to be given back to the Jews. It had lain fallow and the Ottomans had done nothing with it. It was nothing but swamps or desert and weeds. Arab nomads would ride through on camels, and that was about the most that happened with it. It was merely a crossroads without an inn. Jews lived there, but kept out of sight except in Jerusalem. They were treated as all Jews in the Middle East, that of Dhimmis class. In other words, they had been held down and not allowed to do anything of importance to the land due to their class. Last week, International Holocaust Remembrance Day was observed. Just a few days before this date, the PA (Palestinian Authority led by Abbas) published an article demonizing Netanyahu, Israel's Prime Minister. They claimed that he has Nazi genes and uses racism, which is something Hitler was doing, against the Palestinians. The PA are showing their lack of education. One does not have "Nazi" genes and inherit a political agenda through their bloodline. Given a DNA test, Netanyahu will show he has very Jewish genes, inherited from the time before Moses. That's where environment comes in. If your parents are Nazis, there's a huge chance that they will teach you to believe in their philosophy. Who is actually practicing racism are the PA who plan on their state having no Jews living there. So for the PA to call Netanyahu a racist or having Nazi genes is ridiculous, but the sad thing is that their people will believe it and accept it as fact without any logical thinking. I have no doubt of this for why would they say something as ridiculous as this in the first place other than embarrass themselves before the rest of the world population. The information on the Palestinians, Arabs who call themselves this term, is huge. Joan Peters wrote the national bestseller, "From Time Immemorial-the origins of the Arab-Jewish conflict over Palestine," which is something everyone should read before they comment on this group of people. The pocket-book version has 412 pages and another 164 pages listing her references. Joan was a Christian newspaper reporter on the Arab side of the conflict who decided to research her topic. When she did, she found the truth about the whole conflict. There had been no country called Palestine. It was simply Middle East Land that had been Judah and Samaria, or Eretz Yisrael that was renamed by the Romans after they conquered it. Arabs living there in 1920 when the League of Nations created the Jewish Homeland were nomadic, and a few owned land there. Most sold their land to the Jews as it was terrible land and they preferred to take their sale money and move to places such as Paris or Beirut where there was life. Only to the Jews was the land important. Joan's book remains to be the most thoroughly researched and solidly documented work on the origins of the Arab-Jewish conflict. She did massive research and had gone to the Ottoman records, the reports of Western consular officers and observant travelers and other sources. It's a remarkable document in itself. With determination, brilliant detective work and patience, Peters managed to unearth a foundation of facts, research and commitment to truth. So the lady, who started by being on the Arab side of the conflict, did a 180 turn around and found herself on the Jewish side. She has since been an adviser to presidents. Her book gives us the proof that so called experts on the Palestinian issue speak from utter ignorance. Millions of people the world over are smothered by false history and propaganda and that is exactly what the PA are again dredging up. The reason for this charge of Netanyahu having "genetic" Nazi genes even though he is a Jew, and no Nazi would have ever had a Jew in their midst, is because he is explaining that it is most important for the Arabs to recognize Israel as a Jewish state. This is why the ratio of Jews to Arabs must be that Jews are the largest group. It was not just any state coming into the UN. The Muslims have 48 Muslim majority states already and Palestine would be the 49th. Does anyone see India other than a Hindu state? The Muslims living there finally have their own state of Pakistan which is 97% Muslim with 172,800,000 Sunni and Shi'a. It's an Islamic state. The USA is a Christian majority country. Jews were originally the Israelite tribe who are followers of Moses and the Mosaic Law, called Jews -from the tribe of Judah who were established c1300 BCE. Jews have been here for the past c. 3,314 years and they are being attacked for being awarded their own state legally by all the nations except one group of people calling themselves Palestinians who want to turn it into their Muslim state? To have one Jewish state as a refuge in the world is why Jews need this state of Israel in the first place. Time has proved this need. With the Holocaust proving that 6 million Jews were slaughtered from 1939-1945 as the most recent event, leaving 14 million alive today, the need is great. The past has been such as being expelled from countries such as in the year 115 from Cyprus, 1290 from England, 1306 from France, 1355 from Spain. From 1882 to 1890, 750,000 Jews living in Russia were forced to re-settle into the Pale of Settlement, which was Lithuania, Latvia, Belarus, Poland and Ukraine, and were not allowed into Russia proper. They were expelled from Moscow and St. Petersburg in 1891. How about the massacres of 1096 in Europe, 1355 in Spain, 1420 from Toulouse, France, etc. Forced conversions were put upon Jews in 640, 721, and 873 in the Byzantine Empire. Jews are tired of living at the whims of other political agendas and being the scapegoats of everyone's problems. Though this is 2014, countries still behave like they did in 70 CE. Facts About Israel, Division of Information Ministry for Foreign Affairs, Jerusalem.